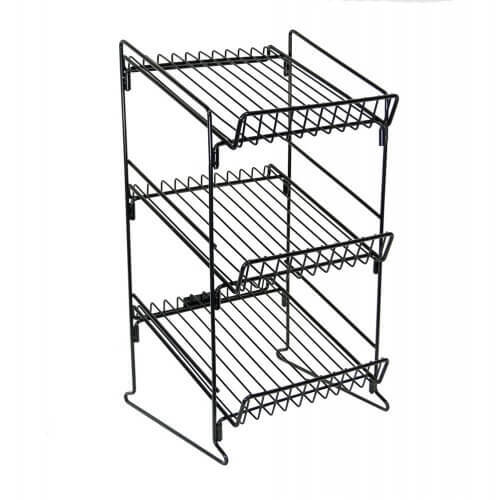 3 Shelf Wire Counter Display Rack stands just at 23" high. 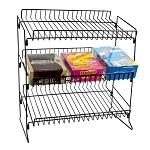 Each of the three shelves measure 11" W x 2" H x 12" D, which gives you plenty of room to advertise impulse merchandise like your fresh baked cakes and pies, homemade cookies, candy bars and much more. Our counter-top fixture is made of heavy duty steel tubing with a black colored finish. 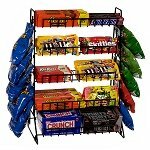 Add your metal wire display to checkout lines, service counters, or in your break room filled with other delicious prepackaged goodies for your employees to purchase. 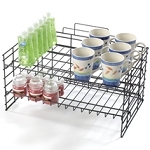 This wire fixture is a wonderful idea when filled with coffee additives on your self-serve beverage bar, ketchup packets in your snack bar, and apparel accessories. 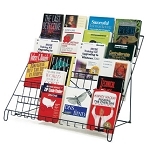 Invest in your retail displays by ordering your counter rack today and save!